In this contribution to the Know Your Monuments series, Muiris O’Sullivan and Liam Downey outline the evolution in recent centuries of hurling, Gaelic football and camogie. Games unique to Irish culture, in particular hurling, Gaelic football and camogie, have been widely played in Ireland over different periods, as further detailed by Kinsella (2009). While hurling underwent substantial evolution during medieval times, Gaelic football appears not to have been a distinctively Irish game until the introduction of standardised rules by the GAA in the 1880s. The game of camogie was not established as a sport until 1904 and was developed by the Camogie Association. Fig. 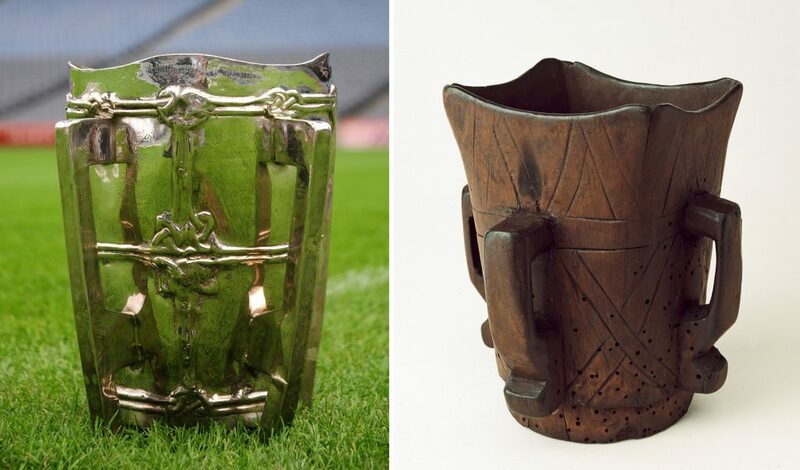 1—The All-Ireland Senior Hurling Championship Trophy (MacCarthy Cup, above left) and a vessel known as a mether (left), in which bog butter may be found (courtesy of the National Museum of Ireland). Historical sources show that hurling was widely known in Ireland during the last millennium (Ó Maolfabhail 1973; Ó Cathnia 1980; O’Sullivan 1998; Ó Maolfabhail et al. 2009; Kinsella 2009; Rouse 2015). One of the earliest written records for hurling is contained in the well-known Statutes of Kilkenny, enacted in 1366, which prohibited ‘the games which men call hurlings with great clubs of a ball on the ground […]’. The enactment of this clause points to the apparent widespread playing of hurling at that time. A similar statute was issued in 1527 by the mayor and corporation of the city of Galway. Again, this prohibited the ‘hurling (horlinge) of the little ball with hockey (hockie) sticks or staves, nor use no handball to play without the walls but only the great football […]’. One of the first references to hurling in the seventeenth century was by Geoffrey Keating, the renowned author of Foras Feasa ar Éireann (1634), among other influential historical and religious discourses on Ireland. In 1620 he was critical of the ‘conceited young men […] leading a wild life, playing ball, shooting darts and arrows, and contending and hurling, drinking and playing, swearing and babbling’ (Ó Maolfabhail 1973). The prevalence of hurling was further attested to in 1695, when the Irish parliament passed the Sunday Observance Act. This curtailed the playing of certain sports, which ‘frequently are used on the Lord’s day under the pretence of hurling, commoning, football playing, cudgels, wrestling, or other sports’. The progressive evolution of hurling led to the emergence in medieval times of two principal forms of the sport, namely summer and winter hurling (Ó Maolfabhail 1973; Ó Maolfabhail et al. 2009; Rouse 2015). Summer hurling developed from the seventeenth century, particularly in the south and east of the country. Ó Maolfabhail asserts that a letter dated 1667 from Lord Orrery (president of Munster) gives an approximate date for the playing of summer hurling on the borders of Munster and Leinster. Newspaper reports of hurling matches during the eighteenth century refer to games played between May and November, and chiefly in venues in the vicinity of Dublin and the Munster–Leinster border. As synopsised in Box 1, it was typically played with a broad-bossed hurley, which allowed the ball to be carried and involved more aerial play than was common in winter hurling (below). Teams often consisted of 20/21 players, but upwards of 50–100 or more are also mentioned. The players seem to have been divided into defenders, midfielders and forwards. Summer hurling had many features resembling those of the modern game, and may indeed have foreshadowed its progressive development to an appreciable extent. 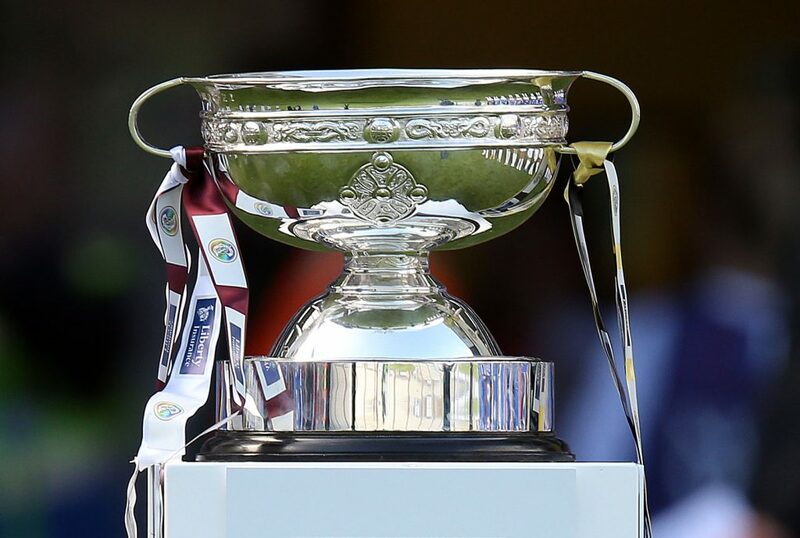 The MacCarthy Cup, awarded to the winners of the All-Ireland Senior Hurling Championship, resembles (Fig. 1) the four-handled vessel known as a mether in which butter deposited in bogs, mainly during prehistoric times, has been found (Archaeology Ireland, Summer 2004 and Spring 2006). The game was usually played in a large, level field or, in some localities, on a suitable strand, and cross-country hurling was also known. The goals were positioned at the extremities of the playing area. Often a single goal could decide the outcome of a match, which might last all day. Gentry and landowners fielded teams of their tenants, and matches were played between townlands, parishes or baronies and, not infrequently, counties. A detailed scientific investigation has recently been published (Doyle 2016) of hair hurling balls (Fig. 2) contained in museum collections. 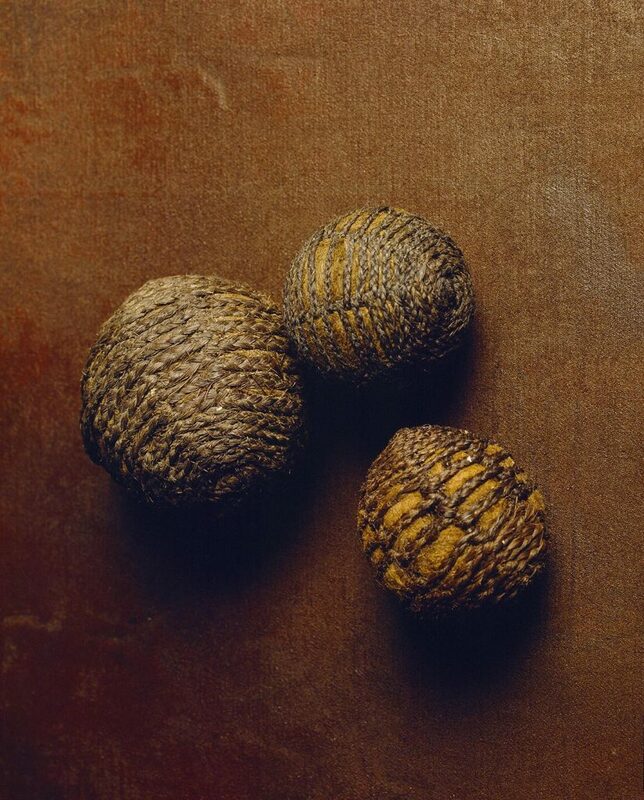 A number of the balls dated from the late sixteenth century, when, as previously indicated, hurling was widely played and the statutes of Kilkenny (1361) and Galway (1527) had been enacted to control the spread of the game. Further details on hair hurling balls are contained in an article in this issue by Clodagh Doyle. Above: Fig. 2—Hurling balls recovered at Tooreen and Toornageehy (Co. Kerry) and Lavally (Co. Sligo) (courtesy of the National Museum of Ireland). From the eighteenth century onwards, the main stick-and-ball games in Ulster were played primarily in winter (Ó Maolfabhail 1973; Ó Maolfabhail et al. 2009). Known variously as camán, common, shinny and camanacht, the game was played primarily by striking the ball on the ground and was akin to the Scottish game of shinty. As shown in Box 1, winter hurling was played with a narrow stick, bent at its lower extremity and used to strike a wooden ball (called a nag), mainly on the ground. The game was suited to winter conditions and was generally played around Christmas and the New Year, sometimes on a suitable strand. The game of hurling is well represented in literature from the early modern period (Kinsella 2009). Summer hurling is widely reported in the seventeenth century and more so in the eighteenth, as further detailed by Ó Maolfabhail (1973). The venues for matches were mainly in Leinster and Munster, although the game is likely to have been more widespread. Summer hurling was sponsored by local gentry families; they picked the teams, arranged the games and supervised matches, which frequently were occasions of gambling. When this support was no longer forthcoming, the playing of the game fell off. The paucity of evidence for the extent to which winter hurling was played in Ireland in the seventeenth and eighteenth centuries has been underlined by Ó Maolfabhail (1973). Before the Great Famine winter hurling was widespread in Ireland, even if rapidly on the decline. Notably, the small wooden ball used in winter hurling is found north of a line from Dublin to Galway, but also south of the line, particularly in the western half of Munster (Ó Maolfabhail 1973). The hair ball (Fig. 2), which, as outlined above, is a feature of summer hurling, is typically found south of the line. Historical evidence for the playing of football in medieval times is evident in the aforementioned statute of Galway, enacted in 1527, which outlawed hurling but allowed the playing of football to continue (Ó Maolfabhail 1973; Corry 2009; Kinsella 2009). From the eighteenth century onwards, however, printed social commentary, combined with the proliferation of newspaper reports, shows that the game was widely played. As illustrated in Fig. 3, the Sam Maguire Cup, awarded annually to the winners of the All-Ireland Senior Football Championship, was modelled on the renowned eighth-century Ardagh Chalice. In the eighteenth century football was played in Dublin, Kildare, Louth and Meath (Kinsella 2009). Matches were often played ‘cross-country’, between parishes. The ball was ‘thrown in’ at the boundary between the two parishes. Victory was claimed by the team that carried the ball all the way to the centre of the opponents’ parish, which could be denoted by a church or other landmark. In other versions of the game the objective was to score a goal, often by forcing the ball through a specially constructed target, as in hurling. Newspaper reports from the latter half of the eighteenth century portray a game with little cohesion and frequent outbreaks of violence. It suffered from the social devastation of the Famine, and in the nineteenth century football does not appear to have been widespread outside Leinster (Kinsella 2009). By 1880 the game seems to have been virtually dying out. Football was revived after the foundation in 1884 of the GAA and its phenomenal growth in the twentieth century. An important milestone in this regard was the drawing up of rules for the game by Maurice Davin, mentioned by Corry (2009) as ‘the man who invented Gaelic football’. His association with Michael Cusack was central in having the rules adopted by the GAA in 1885 and generally applied in 1886. Corry (2009) lists the ten rules drawn up by Davin. They cover the fundamental dimensions of the game of football. An inherent problem with the game, however, was the paucity of goals scored—all too often just one. Soccer-style goals were replaced by point-posts erected on either side of the goalposts. The days of scoreless draws were over, leading to increased spectator satisfaction. Other important improvements were made in the game in subsequent decades (Corry 2009). The field size for both hurling and football was standardised, sideline kicks replaced the throw-in, and the number of players on a team was progressively reduced to seventeen, and to fifteen a side. ig. 3—The All-Ireland Senior Football Championship Trophy (Sam Maguire Cup) and the Ardagh Chalice (courtesy of the National Museum of Ireland). As previously mentioned, camogie was established as a sport in the early years of the twentieth century (Kinsella 2009). An outline of its subsequent development, kindly received from Mary Moran (2011), is presented below. In the early twentieth century, Irish culture was being strongly promoted by the newly established Gaelic League, which was based in Dublin at 8 North Frederick Street. Young enthusiastic people of both sexes were actively involved in the organisation. Many of the girls were from areas where the national tradition and the GAA were strong. The boys of the Gaelic League won hurling and football championships. Soon the girls began to demand a game of their own. Fig. 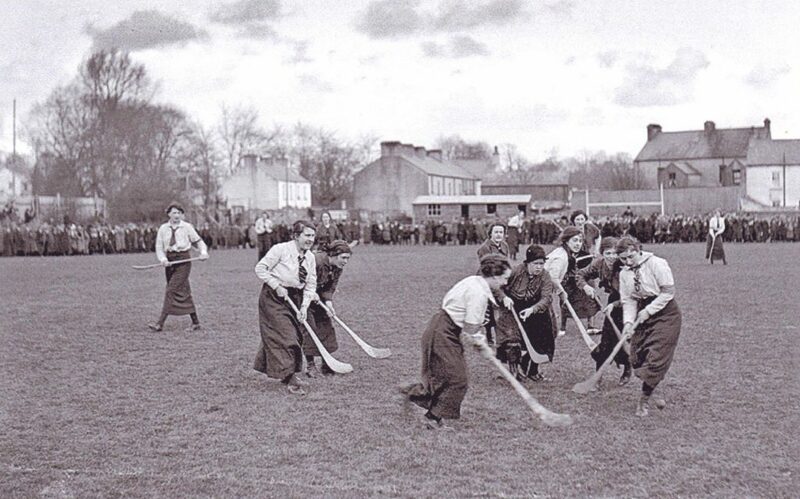 4—Camogie match in 1915 between UCD and UCC, played at the O’Neill-Crowley Grounds, Victoria Cross, Cork (courtesy of Mary Moran). Early in 1903, a group led by Máire Ní Chinnéide (Professor of Irish in Ard Scoil Mhuire, Donnybrook) and including Seán Ó Ceallaigh (Sceilg), Tadhg O’Donoghue (Torna) and Séamus Ó Braonáin (later director of Raidió Éireann), drew up a set of rules based on hurling but modified to suit female players. The girls of the Keatings Branch of the Gaelic League made their way to a secluded spot in the Phoenix Park to practise. The first competitive camogie match was played between two Dublin Gaelic League branches, Keatings and Cuchulainns, as one of the main attractions at a Gaelic League Aeridheacht at the Meath Agricultural Society Grounds, Navan, on 17 July 1904. The public participation of women in team sports was considered socially undesirable, causing some players to conceal their camogie sticks on the way to and from the playing grounds. The number of girls with sufficient leisure time to indulge in organised outdoor sport was very limited, but admission of women to the civil service and a rapid increase in the number of young female students entering the universities and teacher-training colleges began to provide a pool of potential players. Fig. 5—The All-Ireland Senior Camogie Trophy (O’Duffy Cup) (courtesy of the Camogie Association). With a network of branches countrywide, the Gaelic League was instrumental in the promotion of the game. The new sport spread to Newry, Arklow, Dundalk, Cork, Athlone, Belfast and Nenagh within months. The Camogie Association was formed in 1905. A camogie game played in 1915 in Cork is shown in Fig. 4. While the GAA played little part in the birth of camogie, over the years the two associations have become close and share the same ideals, although the Camogie Association remains a separate organisation to this day. Many volunteers have worked tirelessly to promote the game. Three people stand out. Seán O’Duffy (Mayo) played an immense role from 1910 until his death in 1979. The All-Ireland Senior Camogie Cup (Fig. 5) bears his name. Dr Agnes O’Farrelly (Professor of Modern Poetry at UCD) guided the association through the difficult early years. Sheila McAnulty (Co. Down), who was Ard Runaí from 1953 to 1975, played a very prominent role. The advance copy of an upcoming publication on hurling and camogie received from Aidan O’Sullivan is gratefully acknowledged. The text summarising the history of camogie prepared by Mary Moran has been most helpful, as has the information on important aspects of the games brought to our attention by Paul Rouse and Derry O’Donovan. The images and other contributions received from Sandra Heise, Joanna Clarke, Clodagh Doyle, Cian Nelson and Mary Moran are much appreciated. Also appreciated is the help of Noel Culleton and Kevin Twomey. Corry, E. 2009 1873–1903: the battle of the balls. In E. Corry, The history of Gaelic football. Gill and Macmillan, Dublin. Doyle, C. 2016 Hair hurling balls: review, research, and scientific investigations. Folk Life 54, 3–31. Kinsella, E. 2009 Riotous proceedings and the cricket of savages: football and hurling in early-modern Ireland. In M. Cronin, W. Murphy and P. Rouse (eds), The Gaelic Athletic Association, 1884–2009, 15–31. Irish Academic Press, Dublin. Moran, M. 2011 A game of our own: the history of camogie. Camogie Association, Dublin. Ó Cathnia, L.P. 1980 Scéal na hIomána. An Clóchomhar, Dublin. Ó Maolfabhail, A. 1973 The camán in Irish history. In A. Ó Maolfabhail, Camán—two thousand years of hurling in Ireland, 1–53. Dundalgan Press, Dundalk. Ó Maolfabhail, A., Hegarty, R. and McAnallen, D. 2009 From Cú Chulainn to Cusack: ball playing, camán, shinny, and hurling in Ulster before the GAA. In D. McAnallen, D. Hassan and R. Hegarty (eds), The evolution of the GAA, 62–85. Stair Uladh, Belfast. O’Sullivan, A. 1998 Warriors, legends, and heroes—the archaeology of hurling. Archaeology Ireland 12 (3), 32–4. Rouse, P. 2015 The spread of sporting clubs. In P. Rouse, Sport and Ireland: a history, 71–83. Oxford University Press, Oxford. Liam Downey is Adjunct Professor in the School of Archaeology, UCD, and former director of Teagasc. Muiris O’Sullivan is a Professor in the School of Archaeology, UCD.